Joghard: Wednesday (sort of) split 400's on the bike. Wednesday (sort of) split 400's on the bike. I couldn't bear to, nor could I, try to run split 400's (which is on my schedule for the day) on a road covered in ice so I decided to do it on the bike. You can't generate the sustained watts on a bike (no one/ few (?) can) to simulate running at 400 race pace. So the crossover isn't there in terms of muscular stimulation. Cycling is of course muscularly different than running anyway. Split 400's when run correctly are mostly about lactate tolerance and you can elevate lactate to similar levels which was the goal today. I decided to also throw in some off the bike strength stuff which I've been doing during bike sessions since the 90's. 1996 to be exact. Wu) 5:00 easy spinning. Then kettle bell swings, bulgarian split squats in the TRX, isometric squat rounds for 40" on/ 15" off. Spin on the bike for 10:00. 45" best efforts/ spin easy for 1:00/ 15" MAX output with cadence 95-100 revs. Brutal. Off the bike to 40" iso squat/ TRX split squats as 15 concentric reps followed by isometric hold to failure/ 20 KB swings. Spin easy for ~2:00 or so. Then hit the next round. Good workout. It felt good to be on a bike. 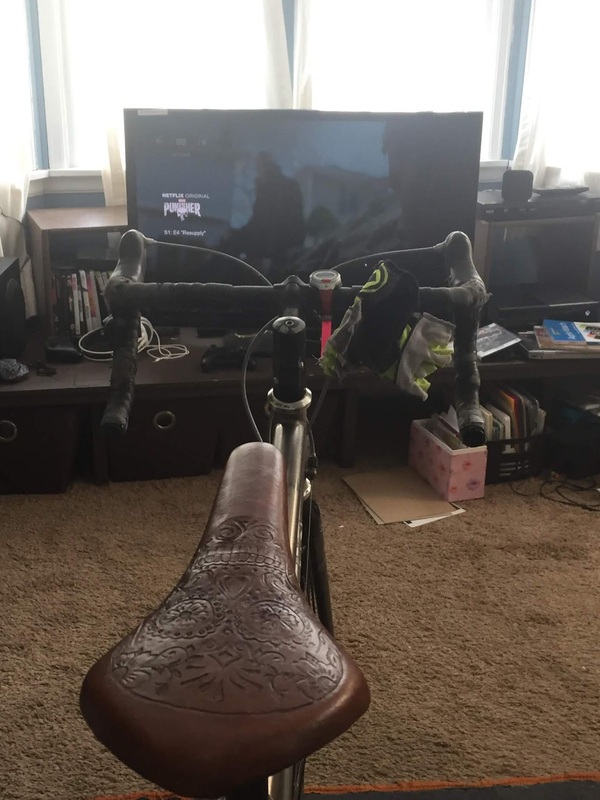 I watched The Punisher whilst riding.